You heard me correct, I said chocolate covered Cheerios. My kids begged to have them for breakfast. They are made of Cheerios after all. In the end I said no to them but I will look the other way if you eat those for breakfast. It was crazy cold out here in Phoenix the day I made these. We aren’t used to cold cold winters. I melted the chocolate in very small batches because I knew the temperature would firm up the chocolate quickly. I know you will be tempted to do big batches of this but little batches are best, trust me. These Cheerios are amazing. I think anytime you mix carbs and chocolate you have a winning combination and these Cheerios don’t miss the mark. 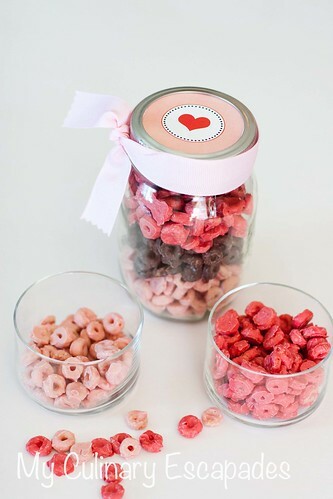 Pink and red chocolate dipped Cheerios with chocolate chocolate dipped Cheerios stacked in a mason jar with an adorable printable on top is a perfect gift for someone you adore. The printable came from the talented Anna and Blue Paperie. I love the way it looks on the top of the jar. Choose one color of chocolate and melt it down in 20-30 minute intervals in the microwave. Once it is just melted put a small handful of Cheerios in the chocolate and stir it to coat. Using a fork scoop up some Cheerios and tap on the edge of the dish. Using a toothpick or knife slide one Cheerio off the fork at a time onto parchment paper. Repeat with the other chocolate colors. Once the chocolate has hardened take Cheerios off the parchment paper. Gently rub in between your hands to break off any trails of chocolate that may have happened when dipping. Place in individual containers or stacked for a dramatic presentation.